Now I grew up in Boston, and something you have to deal with in Boston (especially this winter) is nor’easters. Nor’easters are strong winter storms that intensify off the American northeast or mid-Atlantic coastline and deliver strong winds, coastal flooding, and plenty of rain or snow. They are a winter phenomenon, but can occur in the fall or spring. Hurricane Sandy was such a disaster because its late-season arrival got it swept up into a nor’easter. The combined force of a nor’easter and hurricane created a storm many of us may never see again. 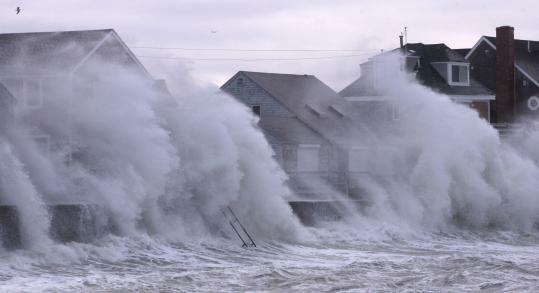 Scituate, MA: Welcome to New England. Nor’easters are a great topic I would like to get into soon, especially while snow is still falling. But tonight I wanted to bring up the name. Nor’easter, what does it mean? If you asked me as a child I would have probably guessed that the name comes from the region they occur. They hit the northeastern United States and were thus dubbed “Nor’easters.” It made sense to me at the time, and it still makes sense to many today. But it doesn’t quite make sense when you rewind the clock a few hundred years and New England isn’t really the northeast of anything. So why are nor’easters called nor’easters? It’s the wind! When you’re dead in the bulls-eye of these storms the winds are coming from the northeast. Check out these images from a recent nor’easter on February 13, 2014. 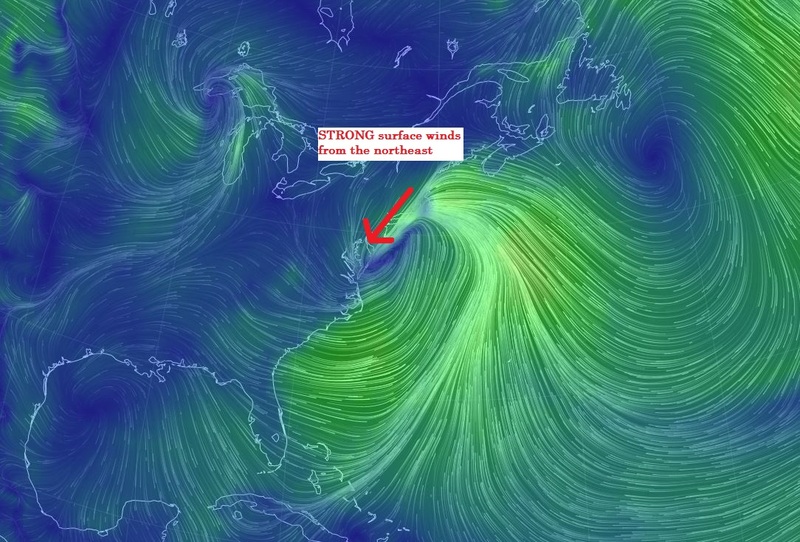 As with any low pressure system, surface winds travel counter-clockwise around the center. When the centers of the systems are off the Atlantic coastline, these strong northeast winds will come onshore at coastal points just northward. 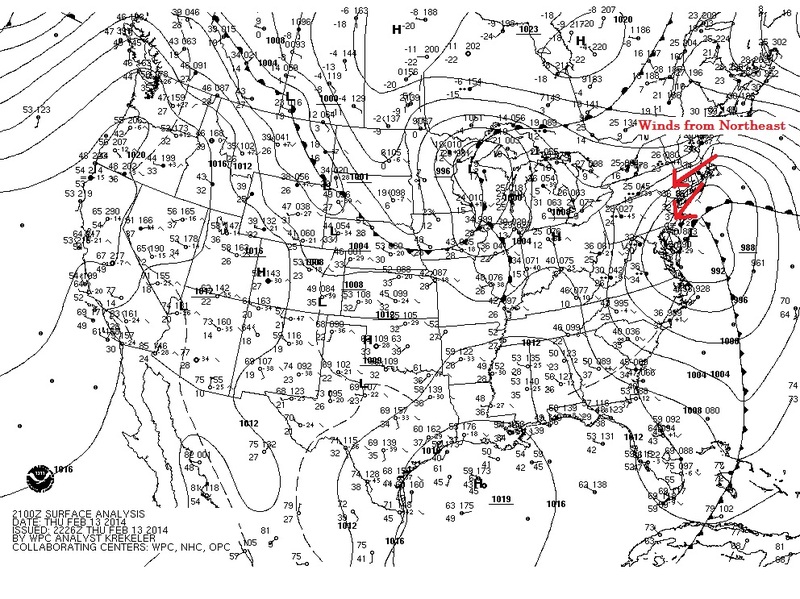 For example, the center of many of the bad nor’easters I experienced in Boston was off the New Jersey coast. For hundreds of years people living in New England noticed that the strongest winds in these storms came from the northeast, and somewhere along the line the name was created. And while there is plenty of debate on the exact history of the term, the reason for the term is undeniable.